Well, it was just as wonderful as the last one. 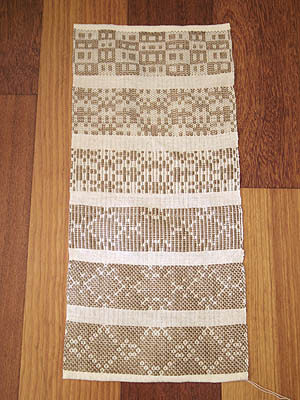 The theme of the previous was mixing two weave structures. 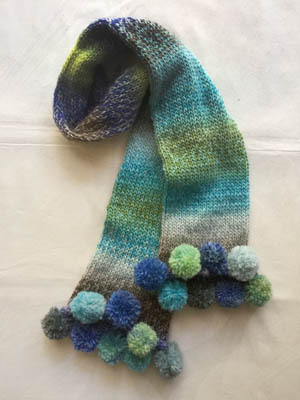 There is always room to pursue something personal, and I’d mentioned that I’d like to try Summer and Winter, so I mixed it with double weave. This time the theme was Summer and Winter. I went with the option of prewarping our looms with a draft Kay provided. Despite that, it took me a day to get my brain back to the level of understanding I reached at the end of the last workshop. By the third day I had two samplers done. 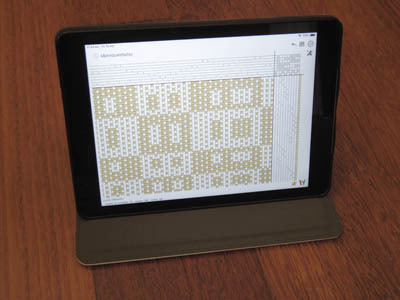 On the fourth I created two drafts I liked, using the iWeaveIt app on my iPad and some help from Kay in Fibreworks. 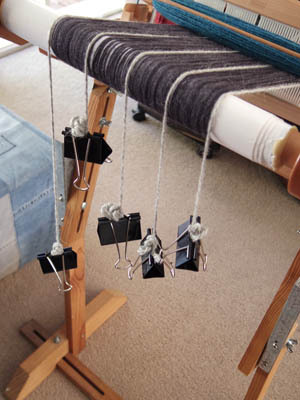 I rethreaded my loom to weave them. I now have a pretty good grasp of Summer and Winter. 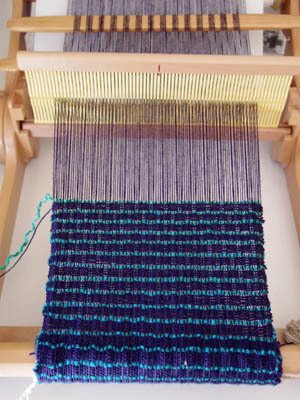 I’m hoping to finish off the warp by weaving matching placemats – but not straight away. My back was a bit touchy after so many hours of weaving in a row, and I have recently developed the beginnings of a frozen left shoulder. And I think my brain could do with a rest, too! I love it! 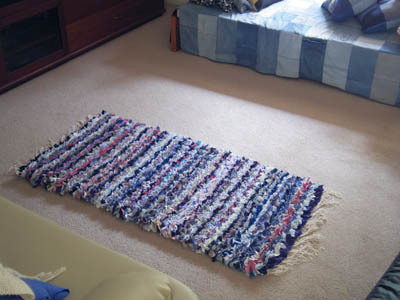 It’s cushy and attractive and was inexpensive to make. The fabric strips don’t seem to stay pressed down when it’s walked on. It’s big enough for the room without costing a fortune. One of the unexpected, but in retrospect kinda obvious, benefits of a rya rug is that the tufty nature of hides seams. I’ve learned a great deal while making it, most significantly that this method uses a LOT of fabric. 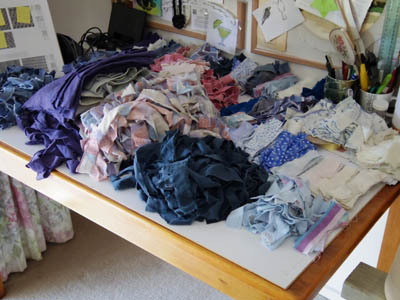 If I was to make another I’d have to find a source of free rags, because if I’d used $7 mens shirts from the op shop this would have cost around $700 in fabric alone. 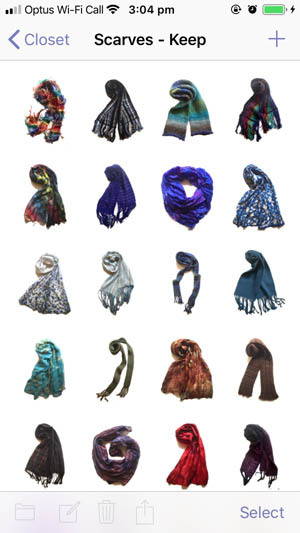 I’d like to try making one out of t-shirt rags. It’d have a different texture, I reckon. More spongy, not as soft, I reckon. 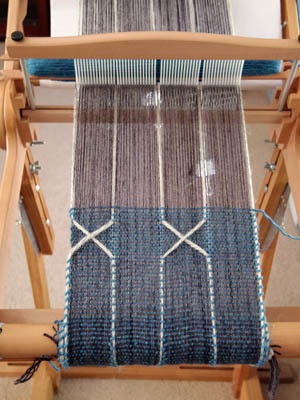 Next project on the floor loom will probably be a very long table runner using a combination of methods I’ve not seen before: weft rep and clasped weft. 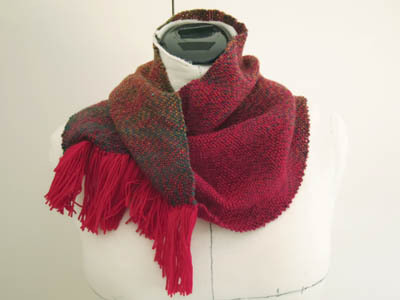 I’ve done a bit of test weaving, and I think it’ll work. Well, I hope so, anyway! So it turns out I have tennis elbow as well as a return of RSI. The term ‘tennis elbow’ annoys me somewhat, since it makes it sound like I developed it because of a recreational activity, not work. I got to thinking, after a friend suggested I come up with better names, that I would rename my maladies more accurately. So I have Writer’s Wrist, Editor’s Elbow and Novelist’s Neck. Or maybe that should be Weaver’s Wrist. Hmm. Resting my hand and arm meant finding occupation that didn’t use it. I turned it into planning time. Getting out my entire stash, I plonked it on the office floor. Then I printed a pile of project sheets. 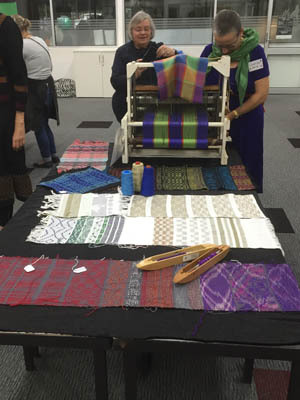 Then I went through the ‘ideas’ section of my weaving folder, my stash spreadsheet, visual journal, notebook on my phone and the Craft To-Do list on this site, and wrote a list of projects, ideas and weaving structures I wanted to try. A big mix and match session followed. By the end of the second day, I had twenty project sheets partially filled in and a list of 15 less developed project ideas. Part of the motive behind this was that I never did get all my stash to fit in the wardrobe after my big craft room cull, and I hoped a reshuffle would fix that (it didn’t, but there’s now only one bag of yarn hanging off a door handle). Another part was a feeling that’s been growing these last few years, as I learned more about issues with ethical clothing and waste in general, that there’s an obvious conflict between constantly making stuff and not filling the world with more trash and toxins. Both had me determined to use what I have. Also, as I considered each project, I asked myself the same question I do when considering buying clothing: “Do I really need this?”. It was a sobering question, as the answer was pretty much ‘no’ for all of them. So I asked: “Could I gift/sell it?” but that was followed by: “Am I then just filling the world with stuff nobody really needs?”. I’m a creative person. I’m not going to stop making things. If I gift or sell them, I can’t know if the person who owns them really needs them. Heck, I can’t guarantee if a gift recipient, whether from me or a buyer of my things, will even like them or, if not, pass them on to someone who will not toss them. But I can try to reduce the impact of the making of those things by making sure the materials, tools and methods are as sustainable as possible. It’s cushy and weighs more than it looks like it’s going to. I had to buy even more fabric: four shirts and a pillowcase from an op shop. The rug was still 5cm too short, but I’d had enough. 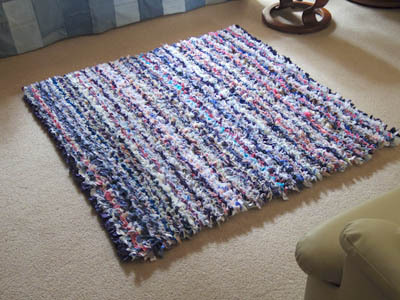 5cm won’t make much difference to the overall size of the finished rug. I’ll be finishing the edges after I attach the second half. I wove several rows of 8/2 cotton to fold under and encase the knots. First time I’ve tried that. Will see how it goes. The second half should go quicker, since I have already torn and cut the strips. 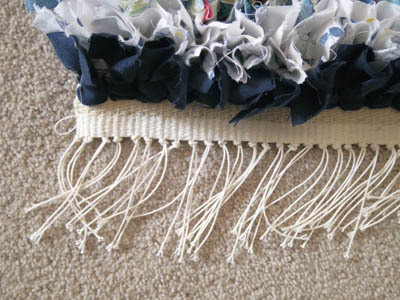 When I began weaving it I pinned a piece of cotton tape to the start and put a knot at the length I wanted the rugs to be, so I would know where to end the first one, leave a gap and start the next. 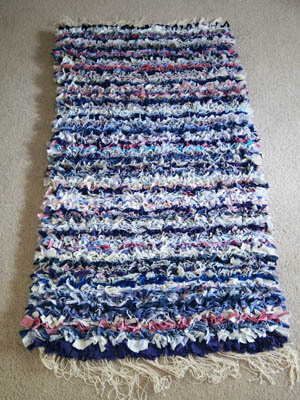 When I had nearly finished knotting in all the strips of fabric I’d cut, having estimated from the knot on the tape and the rows of knots I’d done already that I should have enough, I found the rug was about 15 cm too short. I wondered if the tape was stretching and the rug was actually longer than the tape was saying, so I decided to loosen the warp and measure what I’d woven so far with a measuring tape. I discovered it was actually 40 cm too short! 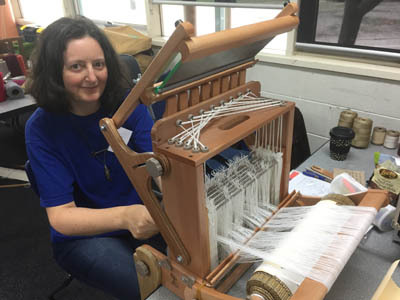 Perhaps the tension of the loom was stretching the warp quite a bit. 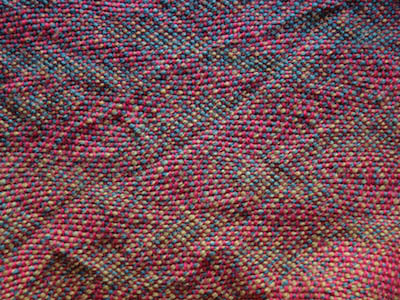 Perhaps the thick fabric it was creating was pulling in the warp quite a bit as well. Perhaps I didn’t measure the tape properly. Whatever the reason, I needed many more strips. So I tore more from the leftover fabric given to me by my friend, and went on a hunt for more fabric. Two other friends had volunteered some fabric scraps, so I made arrangements to visit and raided their stash. 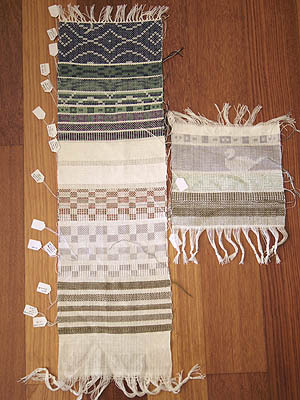 This is the collection of strips set aside for the second half of the rug. I reckon I’ll have the whole table covered by the time I’ve finished the first half. To fill in the time before the visits I’d arranged, I went back to working on the mosaics. The tiles I’d got from a friend weren’t the same blue as the ones I needed, but complimented the hue. 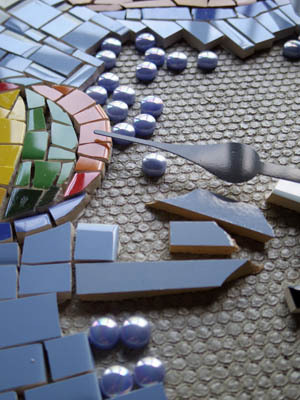 In my earlier hunt for other ways to finish the mosaic I’d picked out some round glass tiles. They looked a bit like bubbles to me, so I figured I’d put some between where the old and new tiles changed. I needed more, so I ordered them. The shop also had some 10×10 tiles in blue, so I ordered one of each of the three colours on the odd chance they’d match the one’s I’d run out of. It turned out, they did. There’s the slightest difference, so I’m still going with the glass ‘bubbles’. But before I could do that, I needed to stick down some tiles on the bird bath. Well, once I got started I kept going. 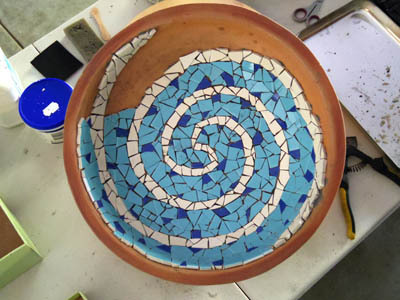 I’m using a mix of grout, water and glass mosaic additive as glue, which is what we used in the class. It’s frustratingly fast setting, so I have to mix up a tiny bit at a time and the last few tiles I attached usually come off again. I’m hoping that the final grouting and sealing will keep everything in place. 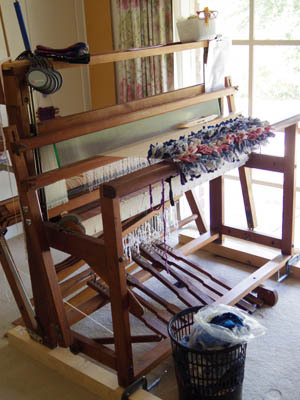 On the Australia Day weekend it finally happened: I warped up the floor loom. I had thought the craft room tidy up might get the creative juices flowing again, and I was right. It was the push I needed. Not in the way I expected, though. I thought clearing space for the looms would declutter my mind. Instead it was the need to do projects in order to make space that spurred me into action. The project is the rya rag rug, which is not only using up the old shirts, sheets, fabric scraps, table cloths and pajamas I’ve been collecting for this project and the craft yarn I bought for it over ten years ago, but also a pile of shirts, sheets and a skirt I’d but a side for possible refashioning. And an excess of rags in the rag bag. 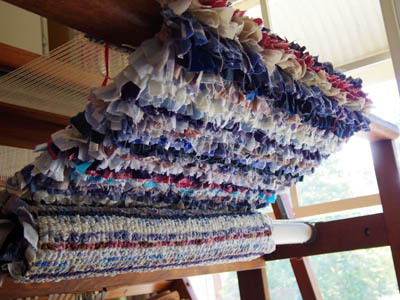 I cut everything into strips first, then dressed the loom with rug warp, making it twice the length of the rug I wanted so I could make two then join them together. 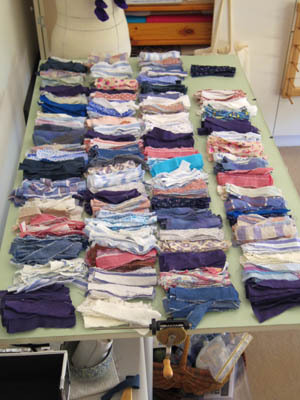 I cut up each pile of strips into 15cm lengths as I weave, then collected them into batches of 34 – one to weave now, one for the second half of the first rug (to make sure the colour spread was even across it) and another two batches for the second rug. This was very slow work, but it told me that I needed to acquire more fabric and now that I’m on the second half of the first rug the rya knot rows seem to fly by. 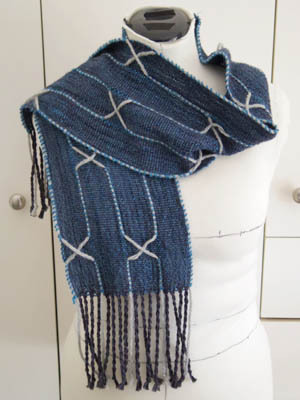 I had a minor panic at nine rows of rya knots in, as the fabric wasn’t growing as fast as I’d calculated and I was worried about running out of craft yarn. 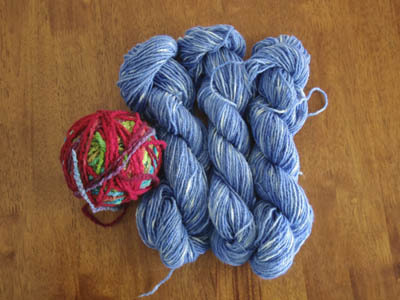 So I did a whole lot of internet searching for another yarn to pair with the craft yarn to bulk out the weft. 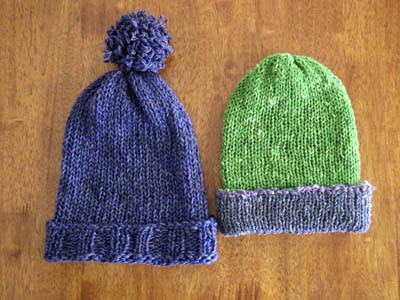 Then I redid my sums and realised I’d forgotten a step, and I still had enough yarn anyway. Me and my absent-minded maths. At 25 cm I’d done enough to know I’d run out of rags less than halfway through, so I put out a request for old shirts, sheets and such from friends on Facebook… and got almost no response. Guessing that everyone had done their end/beginning of year cull and tossed the excess already, I searched the garage for old sheets to use as drop sheets and found one that was perfect. One of the two friends who responded let me rifle through her pile of fabric scraps, which gave me a good sized pile of fabric that mostly didn’t need seams cut off. That turned out to be enough to cover the whole rug. Now that I’m not running around looking for more fabric, and cutting up endless strips, it’s settled into a relaxing weave. I’m hoping it lasts through most of February, giving me something creative to do in work breaks. I’m also liking how it’s coming out, all thick and stripy. 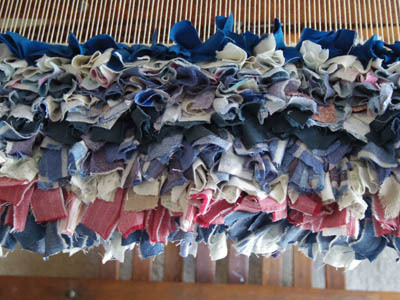 And I’m now thinking about other methods of weaving rags and fabric, as I think about what I will weave next.